You daydream about it: turning your side gig into your career. Quitting your day job and achieving your business goals on your own terms. But it can be hard to know when the right time to actually make the move is. 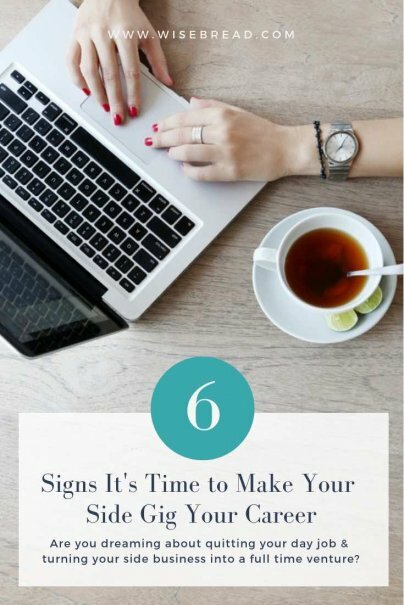 If you're unsure what's holding you back, but suspect you may be ready, take a look at these six signs it's time to quit your day job. Are things going pretty well right now? It's time to do the math. Add up all of your household's living costs. Now, add up your side business's month-by-month revenue over the past year. Can a decent percentage of basic expenses be covered by your side business? Making a big move based on this sign depends on a couple of factors such as how much your spouse or roommate contributes to the household, and whether or not those contributions can be counted on for the foreseeable future. For many people, the answer is a gradual transition. In my business, my partner/husband and I found an arrangement that let us spend 75% of our time on the company, and the rest of the time on freelance income to bridge the gap. Are more opportunities arising, ones you don't have the time to take? A small business can only flourish if it has enough time to grow the infrastructure and increase client communications and partnerships. If you can only spend nights and weekends on your side business, then you will hit a plateau that is very difficult to break through without hiring help. The best way to learn if you are leaving money on the table is reviewing your business plan and making a new year-to-year projection. Surely you've had more ideas on how to upgrade your services. Do you see your customer or client base growing and becoming more reliable? This kind of stable growth begetting a stable fan base is a good sign that your regular clients are ready to be upsold on more services. If you are B2B, don't let them grow antsy to leave for a bigger company. If you are a consumer-facing business, don't let your customers grow bored with your product offerings. Start with your most loyal customers to show them that your business is growing with their needs and that you value your relationship. In my business, we grew so quickly in the past year that our customers were not able to keep up with our newest releases. So we started a new subscription program for our most rabid fans that allowed them to get everything we make for a monthly fee. When you start with your most loyal, you can work out the kinks of the new program with minimal pain and customer service issues before rolling it out to the public. We wouldn't have been able to plan, set-up, execute, and maintain this new service if one of us hadn't gone full time. Are friends, family, and peers increasingly asking you for advice or resources on your industry? If so, the outside perception of your company must be good enough for you to be considered a thought leader on the topic. A great way to give back as an entrepreneur is to share your expertise. It's also a great way to grow your business indirectly by inserting yourself in the major ongoing conversations within your industry. Look up industry conferences to attend, and you could create a Slideshare about what you've learned. When you have become a full-time entrepreneur, others will take you even more seriously. If you were already planning the full-time transition, this sign might be the morale boost you needed. Is your household changing? Maybe you are planning to have children in the next two years. Maybe your spouse is earning enough money to cover the basic expenses so you can take more time on your business. Staying at home provides you the flexibility to grow both your business and your family on your own schedule. Do it smart: Using your monthly expense calculator and business projections, start mapping out a plan that allows you transition to a home office. Calculate the costs of making a functional home office: desks, computers, office and creative supplies, and storage solutions. You might have to incorporate freelance income in your revenue mix alongside the other services your business provides. Are you looking for help to improve workflow? It will be hard to manage employees from a desk at another company. It's time to look at the numbers and see how much more revenue you could earn with an employee's help, versus quitting your day job and doing most operations yourself for a while. People-specific skillsets you don't possess (i.e. coding, graphic design, etc.) might be hires you can't avoid. But what if you just have too much basic upkeep to do? What I have learned is that repetitive, tedious, and time-consuming tasks are great to outsource to a freelance employee for an affordable rate. Core work like business development and creative should be left to you until you go full-time, so you can properly manage your employees and give them the one-on-one time they need to grow within your company. Make sure you have what you need to hire your first employee, and learn about managing staff. How's your side gig doing? Ready to make the leap? Great article Amanda, I would add - "You've got a fall back plan". Nothing worse than swapping a side hustle to full time and have things go south a year later.